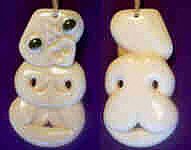 Bone carving — Whitianga is fortunate to have an excellent bone carver/instructor. Ian Thorne operates a studio and assists visitors to create their own mementos of their visit to Mercury Bay whether in traditional Maori style or their own contemporary style. The Bone Studio and Gallery also displays a "mini-museum" of New Zealand carving styles, tools and materials. Don't miss the offerings of The Bone Studio and Gallery. Kayaking — relish the quiet, commune with the birds and playful dolphins in the solitude of their environment. Some motels even offer use of their kayaks. 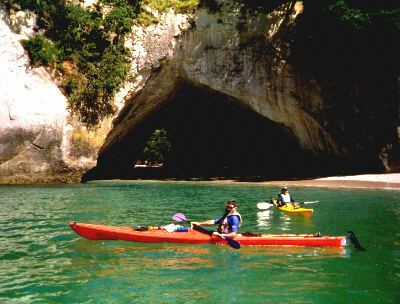 Visit the photos page for some scenic kayaking photos around the bay and in the marine reserve. As a commercial fishing port, there are many boats dedicated to providing fish around the world — long-line tuna fishing and scallop dredging are two of the mainstays. 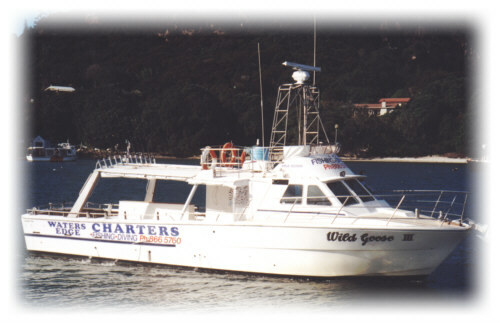 Enjoy a safe boat for a scenic fishing or diving charter throughout Mercury Bay and the Great Mercury Islands. A great place for groups of friends, families and team building, Combat Zone has 9 activities and something to suit most from 6 yrs and over. Kids Quads, Awesome Argo Rides, Archery, Soccer Golf, Target Paintball Shooting, Laser Tag and Clay Shooting. For more information, e-mail them at info@combatzone.co.nz or phone (07) 866 0038. Hot Water Beach — NO visit to Mercury Bay can possibly be complete without visiting Hot Water Beach. Here, a subterranean source of fresh, HOT water comes to the surface. During low tide, you can dig in the beach sand to capture a pool of this water and create your own spa! Read more about this unique physical phenomena and find the low tide time for your visit to world famous Hot Water Beach! 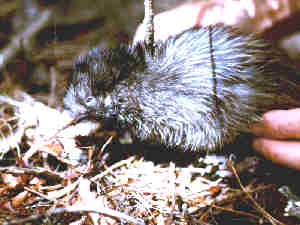 Kiwis — the Kuaotunu Peninsula offers conservationists an excellent opportunity to preserve the native Brown Kiwi through predator control. After only a short time, Kuaotunu locals demonstrated that effective predator control favourably impacts the numbers of kiwi. You may be able to trek down the old road and hear, possibly see, wild kiwi in their native habitat — at night when these nocturnal creatures come out to feed. The "Te Whanganui A Hei" Marine Reserve — This marine reserve is the first of its kind in the Coromandel. Enclosing over 9 sq km, the Te Whanganui-A-Hei Marine Reserve ("Great Bay of Hei," named for the first Maori chief/navigator to land in Mercury Bay), including Cathedral Cove, is one of the precious resources of Mercury Bay. A sea-land reserve, it offers unparalleled swimming, diving/snorkeling, kayaking and trekking. Cathedral Cove is noted for its sandstone arch connecting two small bays along the Mercury Bay shoreline. More than that, it's a local favourite as its beautiful beaches provide an idyllic setting for the occasional wedding! Be forewarned, though, this reserve is protected against boaties damaging the fragile shoreline so it's a 40 minute walk from the parking lot at the top of the hill near Hahei. Fear not! There are several photos of this beautiful area on the photos page as well as in Mercury Bay Online's FREE screensaver (1.12Mb). 309 Road — This 22km road (20 km is metal surface, i.e., unpaved) from SH25 south of Whitianga to SH25 south of Coromandel township is a scenic route with a number of activities. The "don't miss" stop is the 309 Kauri Grove with a short walk into the bush on an excellent trail -- right up to two stands of these majestic trees. Near the Kauri Grove is Castle Rock, the chimney of an ancient volcano whose sides have been worn away over the years. From the 309 Road, it's about 45 minutes to the top of the chimney where you can see both sides of the Coromandel Peninsula and Auckland's eastern shore to the west. Alan Rhodes Pottery offers varied styles of pottery for every purpose. Cloverdale Knitwear offers hand knitted vests, home knitted sweaters and handmade felt hats — all with 100% New Zealand wool. Garden Trail — the Information Centre also sells a small pamphlet as a guide to local gardens. Buffalo Beach — from Ferry Landing to Brophy's Beach, the beach is broken only by two small streams. Take this walk to view Mercury Bay from the foreshore of Mercury Bay in Whitianga. Ferry Landing — cross to the Cooks Beach side of the river to visit the ancient pa (Maori fortification), Whitianga Rock (site of a Maori vs Maori massacre), Ferry Landing's shops or stroll on past Flaxmill Bay to get an unsurpassed view of Mercury Bay from the top of Shakespeare's Cliff — so named because Capt James Cook was reminded of his friend's silhouette. Estuary — walk through town and along the estuary which is protected as a marine reserve. Visit the old stone store, Lovers' Rock and the pathway along the shore. Golf — Mercury Bay has two golf courses, one near the airport at the south edge of town and one at Matarangi. Surfing — the north end of Hot Water Beach seems to attract the area's surfers where they provide action for the spectators lounging in their Hot Water Beach spas! Swimming — from nearly all the beaches, swimming is always safe. The single exception is at Hot Water Beach where rip tides warnings are occasionally posted and life guards are on duty during the summer months. In addition, the Mercury Bay Area School maintains a solar-heated swimming pool which is open to the public. Pristine beaches — let's be fair! Whitianga is the center of Mercury Bay but there are fabulous beaches along the Cooks Beach/Hahei coast as well as the north coast — Whangapoua to Matarangi to Kuaotunu to Otama to Opito Bay! Those are some of the most beautiful beaches in the world — and some of the most deserted! Churches — most religions are represented by the Churches of Mercury Bay.